Photography will help you take a break from photography. Even though we all really love this yo-yo called photography, often even the most passionate photographers need a break from photography. I don’t mean a complete break from it. I’m referring to taking a break from the photography you specialize in or mostly involve yourself with. In addition to this, there are days when stress and a dislike for your fellow man reminds you that you need to get away from it all. You’ve had enough of the city, traffic, mall, noisy neighbours, petrol price hikes, strikes, irritatingly dim-witted facebook posts and society in general. My first longboarding shoot. Erich Scherrer toeside slide, Johannesburg – loads to learn as tricks and perspectives are vastly different from street or ramp skateboarding. Fresh techniques and new angles to explore. It’s about creating a distraction that will give your mind a new perspective. If your portrait work is starting to bore you, or your your action shots are all starting to look the same and you simply can’t see new angles, go shoot some landscape photos or something else that is out of your comfort zone. To me, landscape photography is more than capturing the beauty in nature. It’s about letting go of your brainwashed, jaded way of thinking by experiencing the opposite of daily routine and how it conditions our minds. We weren’t designed to be subjected to the stresses of unrealistic deadlines that end in some sort of substance abuse or mental break-down. In addition, as mentioned earlier, and more important on our road to mastering photography, we need distraction to give our minds a chance to re-group, take stock, and hopefully re-boot in order for us to return with a fresh approach. 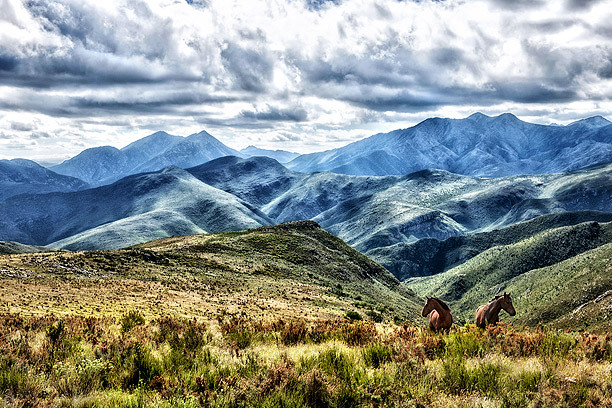 2 Horses in the Baviaanskloof mountains, shot on the amazing 4×4 route that winds through this majestic range. It helps to have an off-road vehicle as it will enable you to reach some of the more remote destinations, but there are many remote destinations that can be accessed by family sedan, so don’t let your vehicle choice stop you from getting out there. Your main aim should be to escape the human race. Once you have reached your destination you will not have to answer to the types you normally have to deal with. Sleep ’till 11am or later. Relax in front of a roaring fire until 3a.m., knowing there is no-one to answer to in the morning. If you see a landscape that needs capturing, shoot it. If you’re to lazy and simply couldn’t be bothered, leave your camera in it’s bag. You’re also here to relax. I can assure you that the bug will bite before long. That bug that makes us photographers. The same bug that keeps us up at night thinking of new kit, new shots and new lighting techniques. 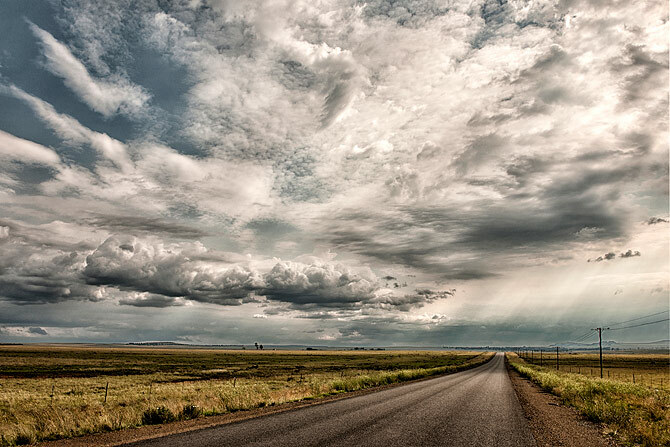 Lonely Free State road waiting on a storm. Landscapes opportunities aren’t only found at iconic locations. Often the simple, uncluttered shots have value. When you don’t have time to go away, go shoot something you love such as skateboarding, mountain biking, running, cricket or football – as long as its a genre that you don’t shoot often. You’ll enjoy getting out of your bubble. Plan the next break from YOUR kind of photography now. Your body, mind and photography need it. One of my favourite oldies. 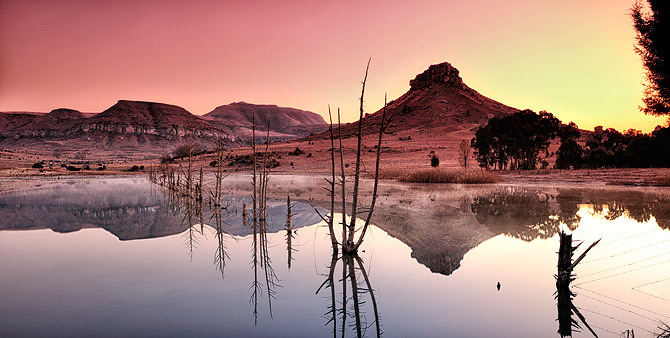 Shot near Fouriesburg in the Free State, this one was part of a mini adventure involving frost covered camera gear at 4am one winter’s morning.